22.8. 2010 Show Ostrava Mansur nomination and BIS winner! Today, 5.4.2011 we birth beautiful healthy kittens! We are planning the birth of kittens from Laluna ! Reserve your kitten now! Kittens will be in different colors with the assumption great size for their powerful parents. On 18.12. 2010 Irving Burcoon*cz was at the show in Duisburg-Homberg, and was nominated for BIS and became the winner of BEST IN SHOW !!! 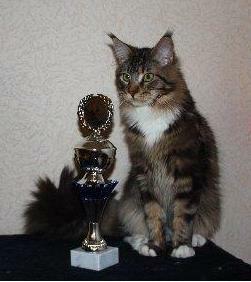 On 12.12.2010 Henry won 1.place in a special competition Interchampion best of all, nomination to BIS and BEST IN SHOW winner !!! 2 x Best in variety, 4 x BIS winner!